Review: Midnight Riot by Ben Aaronovitch – King of the Nerds!!! Midnight Riot, more properly titled Rivers of London across the pond, is the first non-shared world novel of British author Ben Aaronovitch; his previous work was on original novels in both the Doctor Who and Blake’s 7 universes. I have a soft spot for urban fantasy. It is an inclination I fight more often then not and I’ve yet to hit upon all of the particular elements of urban fantasy that really get me excited. The one I’m most certain of is the sense of place. The characters of urban fantasy novels are as often a place as they are an actual person. Thankfully this is something that Ben Aaronovitch does exceedingly well. Midnight Riot is the tale of policeman (probationary constable) Peter Grant whose tendancy towards daydreaming and distraction has earned him a place on the Case Progression Unit; the part of the police force dedicated almost entirely to paperwork. Of course the threat of Peter’s dull new assignment comes after a strange murder and his odd interrogation of a spectral witness. Peter’s ghostly experience casts him into the path of Detective Chief Inspector Thomas Nightingale. Nightingale, Britain’s sole remaining magician is the head (and entirety) of the Constabulary’s division tasked with investigating the bizarre and magical crimes of London. Saved from his new assignment with the Case Progression Unit Peter is drawn into the strange and unseen world of magical London. One of my favorite scenes in Rick Riordan’s Percy Jackson and the Olympians series is a quiet moment when Percy mediates and speaks to the spirits of the East River and the Hudson River (they don’t get along). Not only is the a clever bit of writing but both rivers are integral to the identity of Manhattan itself (their disagreement could easily be seen as an embodiment of the city’s fractious nature). I mention this here because London’s rivers play and integral part in Midnight Riot (again, called Rivers of London in the UK) and help solidify the character of the city and surrounding country. Having not been to London in years I can’t comment too much on the accuracy of Aaronvich’s portrayal of the city. However, he very carefully lends individual set pieces unique character that helps bring the book to life. The empty hall that is home to Nightingale and later Peter is full of faded glory, equal parts noble and sad while simultaneously conveying the sense of a deep and important history. The fair where Peter first encounters the Old Man Thames is rustic and full of vibrant life compared to the aristocratic and somewhat austere nature of the Lady Thames’ court. The bunkhouse of the precinct that Peter first lives in has a light well-lived in quality that lends the scenes there a touch of reality. The careful attention to setting really pays off and for me was as important to the novel as the lead character himself. Peter Grant is the lovable geeky everyman. Confident and charming he is an easy character to root for and one not without his own troubles. Grant knows when to come in with a well-timed quip and when to get serious. If, as a policeman he is sometimes prone to distraction his introduction to the magical world seems to have something of a steadying influence. Given Aaronovitch’s history with Doctor Who novelizations there is something of a companion/Doctor relationship formed with the enigmatic Nightingale. Nightingale is a man out of time and Peter’s provides a link to the modern world in the same way that the Doctor’s companions provide an emotional link to mortal life. Aaronovitch very carefully keeps Nightingale something of a mystery. Copious hints are dropped about past agreements and Nightingale’s age but Peter remains if not quite oblivious at least far to occupied in actual investigative work to really follow up. That actual investigative work is another part of what makes Midnight Riot so good. While this is a fantasy, what with its magic and spirits and ghosts, it is equally as much a crime novel as well. Actual police work is done. Suspects and witnesses are questioned, computer records are consulted, and the legwork of actual investigation works very well to both advance the plot of the novel and explore the magical world. None of this takes away from the magical aspects of the novel and Peter’s early forays into the use of magic are entertaining. His modern interpretation of magic through the filter of science makes for some interesting and often fun, and occasionally explosive, experimentation. Midnight Riot is urban fantasy done right with a great lead and a realistic world it makes for reading that goes down silky smooth. The title change from the overseas market makes little to no sense to me; particularly given how important the titular Rivers of London are to the novel. Without getting into specifics any attempt at Americanization is moot as one of the novel’s major plot points is rooted very firmly in British culture while having almost no foothold in American culture. This doesn’t make the novel unreadable but there is certainly less of a connection to the plot for those not familiar with those elements. Truth be told it is barely even a minor issue and Midnight Riot is a novel that could easily be devoured in a single sitting. 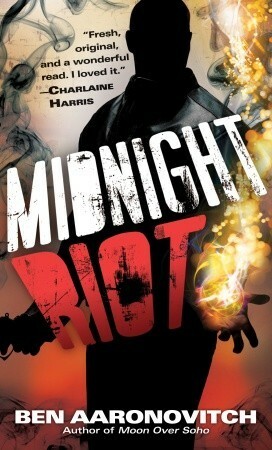 Midnight Riot is a fantastic start to a new urban fantasy series that readers shouldn’t hesitate to pick up. I picked this up last year on an offchance under the title “Rivers of London”, not knowing anything about the author, and thoroughly enjoyed the story. The idea of the rivers having an adversarial relationship, even those that are ‘lost rivers’ walled over in the industrial age, was neatly executed. And you are right – I started reading mid afternoon on a Saturday, and finished around 9 that night.